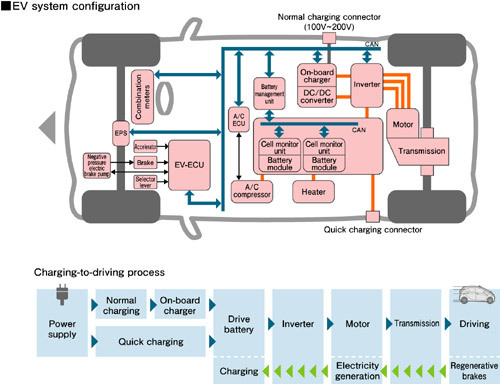 BEV’s – Battery Electric Vehicles, consist of a battery, connected to an electric motor (either AC or DC) via an inverter and a motor controller. As automotive batteries generally operate on DC current, while the gird operates AC, a converter is needed to transfer power to the battery. One of the key advantages of an EV is its much higher levels of energy efficiency. Typically an EV will achieve a system efficiency of 80% from battery to wheel (roughly 60% from grid to wheel), while with a conventional IC engine it’s more like 15-25%. This is largely due to the fact that an IC engine is a “heat engine” (i.e. it has to burn fuel and produce heat to operate) and much of all that heat is simply wasted. Furthermore an IC engine tends to have a fairly narrow range of power output over which it achieves maximum efficiency, which may not match the required torque (this is why cars have a gearbox!). Stopping and starting in traffic, as well as acceleration and breaking also serves to waste energy. By contrast an electric engine does not come with these sort comings. Its efficiency is much higher and the torque range wider. Casing point I was test driving an EV a while back and every time I got to a hill I took off and the BMW behind would disappear into the distance! On a test track I had little difficulty getting it up to 80 mph (so I think we can say we are well past the milk float era). Also an electric motor can also act as a generator. Hence, when you’re braking down a hill or up a set of traffic lights, the car can transfer some of the energy back to the battery via regenerative breaking. One major disadvantage of an BEV is that of the relative weight of batteries compared to an equivalent tank of fuel (about 40 times worse per kg!). Although this is compensated for by a greater power to weight ratio of an electric engine v’s an IC engine, not to mention the fact that and BEV power train is greatly simplified (like I said no gear box, clutch, fuel system and in some cases no differential either!). Also there’s the range issue to consider. While the range of these cars is steadily growing, Tesla claim ranges of up to 430 km’s for its latest Model X. However, while it takes just a few minutes to refuel a petrol powered car, an EV takes hours to recharge. This often leads to a phenomenon called “range anxiety” where a driver, fearful of running out of power drastically underestimates the range of the vehicle, stopping more regularly to recharge or making large detours to recharge when it technically isn’t necessary. In one such example a NY times test driver called a tow truck for a Tesla motors car which still had adequate charge left to reach a charge point (there’s a bit of a dispute here between Tesla and the NYT, CSM article on that here). Perhaps the solution to the BEV range problem could be hybrid cars, in particular “plugin hybrids”. Hybrid cars can be broken down into two general flavours, series and parallel. A series hybrid, is essentially a BEV, i.e. 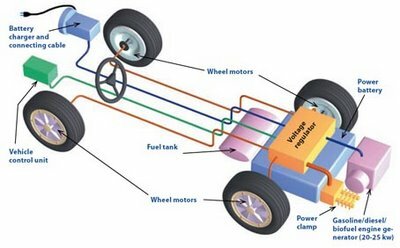 electric motors drawing current from a battery drives the wheels. The difference is that a series hybrid has an engine of some kind (FC, diesel, two stroke petrol, etc.) which is connected to a generator rather than the wheels and keeps the battery topped up. Indeed we often refer to said engine as a “range extender”. Given that this range extender is typically operating at one set speed (and thus operates at much higher efficiency that if it was constantly coping with power demand fluctuations) and it gains all the benefits of an electric power train (regenerative braking, etc.) the result is a significant improvement on a conventional car. The bulk of so-called “full hybrids” (such as the Volt or Prius) or plugin hybrids (where the battery can be recharged via the grid) are series hybrids. The one major disadvantage of a series hybrid is that it tends to be a bit more of a complex powertrain, given that a vehicle has all the hardware of both an ICE and a BEV. While they have been improvised into a standard car chassis for some vehicles. But doing this with much smaller or very large vehicles (e.g. buses or trucks) tends to be a bit problematic (with small vehicles you face the problem of cramming in all that extra hardware in a small vehicle, a truck requires very large batteries and engines to match the performance of the large diesel it is replacing). The parallel hybrid gets around these problems. In this case the IC engine is connected both to the wheels but to an electric motor (via a common crankshaft or via belts). It gains from regenerative breaking and at low speeds the electric motor can drive the vehicle without the IC engine. Parallel hybrid systems tend to be much easier to implement, less costly and considerably less complicated to install. The major disadvantage is that parallel hybrids generally don’t achieve the same levels of energy efficiency as the series hybrid. For example, a parallel hybrid can typically only be driven by its electric motors alone up to relatively slow speed (20 mph sort of thing) and even then only a relatively short distance. One common limitation of both the series and parallel hybrid is the range under battery power. 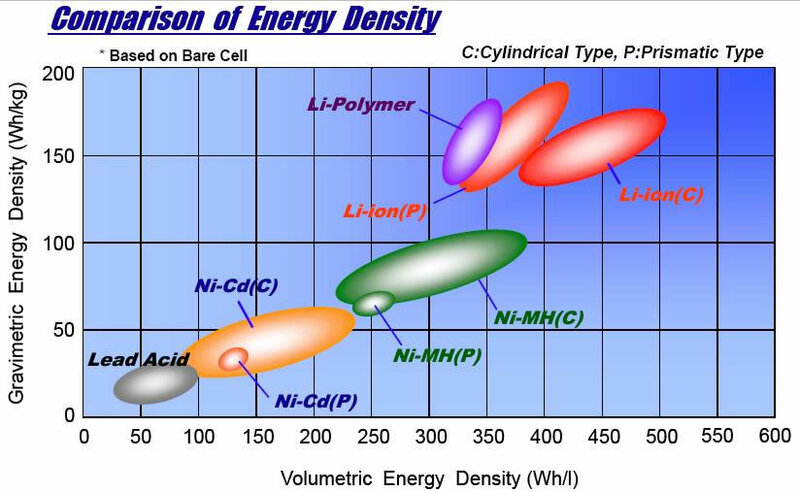 Achieving a longer battery only range, means a bigger battery, but given the weight of that IC engine and all its associated systems in the car there is a tipping point beyond which you’ll be adding more and more battery cells and larger motors, the sole purpose of which is to drive that larger battery around (i.e. it simply isn’t fuel efficient to make the battery any larger compared with a BEV). This is why most plugin hybrids often don’t have terribly large batteries. Generally when we talk about hydrogen cars, we’re referring to a series hybrid powertrain. The only difference is it runs on hydrogen instead of diesel/petrol. There is a common misconception that a hydrogen car has to run on a fuel cell. However, there is no reason why a hydrogen car can’t operate using a conventional IC engine (or Stirling engine or gas turbine engines for that matter) setup to run on hydrogen. 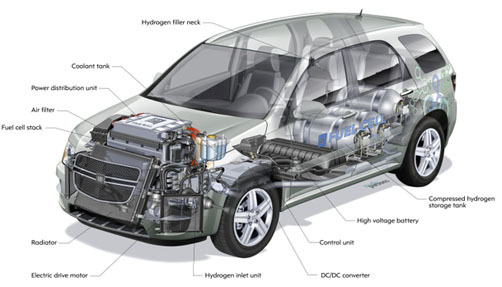 Similarly a Fuel cell car can run on petrol, using a reformer to extract hydrogen from the fuel. The main advantage of using a fuel cell is the much greater thermal efficiency of a Fuel cell (typically 40-50% for an automotive PEM type) v’s a thermal engine (30-40% for Stirling engines, 35-20% for IC engines). Fuel cells are also relatively quiet with no moving parts. However, while fuel cells are getting cheaper and more reliable for static applications, automotive fuel cells still come with a reputation for a lack of reliability as well as high costs. E.g. costs of around $10,000 per installed kW v’s $1,000 for a conventional engine. FC’s also tend to be much bulker than IC engines (again, lower power to weight ratio’s). This latter point will explain why most of the FCEV’s currently on offer tend to be larger SUV or people carrier type vehicles. They simply need a much larger bulkier chassis to squeeze in the fuel cell, its controllers, all that series hybrid power train related gear and those hydrogen tanks. Of course the skeptic would query whether a nice small high efficiency diesel car would actually achieve higher fuel economy and lower carbon emissions than some big FC powered SUV. Given these issues many would query whether these costs and reliability issues are justified by a slight 10-20% gain in overall efficiency from a FC powertrain. Thus the jury I would argue is still out as to whether the hydrogen car of the future will be FC powered or just be a series hybrid with a hydrogen fuelled IC engine.